Email. When the due date comes, a report linked to the schedule is sent by email to a specified email address. File. 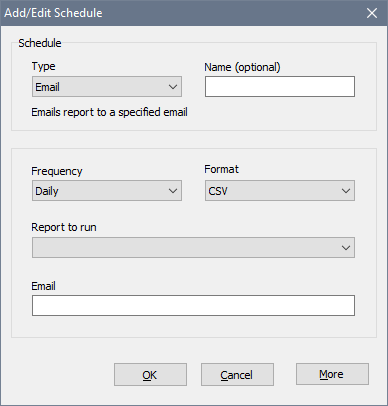 When the due date comes, a report linked to the schedule is saved to a specified file. The current date can be included in the file name, for example date_%yyyy%%mm%%dd%.csv. Scheduled reports can be run daily, weekly, fortnightly or monthly. 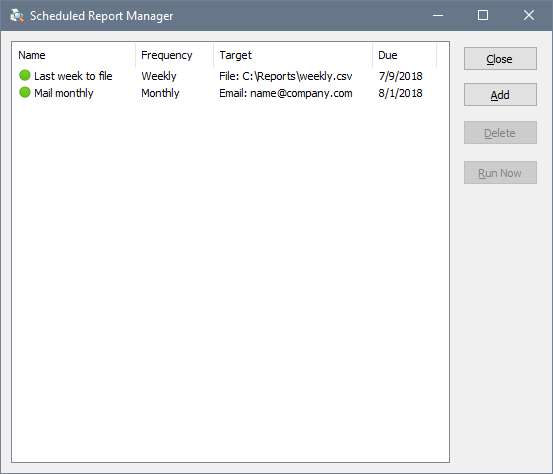 You need to create a report before you can schedule it. Create a report as follows: Type: Detailed, Name: Last month, Show records for: Last month. Schedule that report to run Monthly and specify how you would like to receive it.